This semi-homemade Thin Mint Brownie Cookie recipe is SUPER easy to make and right up my alley. It basically pulls together two boxed flavors that you probably already have in your pantry and combines them into one wonderful culinary experience. Are you a fan of the Girl Scout’s Thin Mint cookie? I certainly am obsessed with them. In fact, it’s the only TYPE of cookie I order every year. You cannot beat that crunchy goodness. 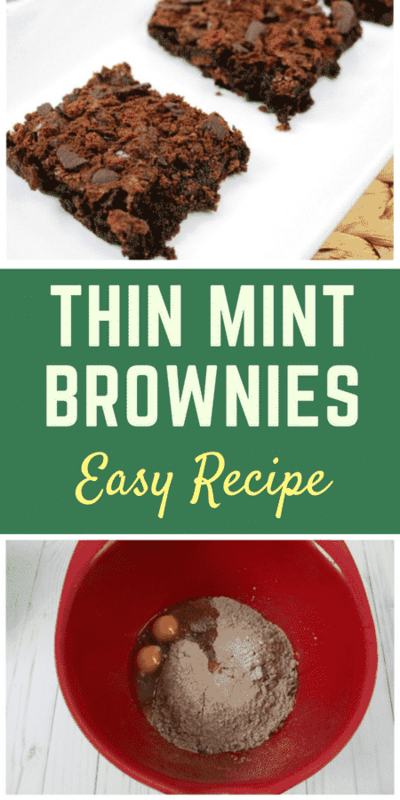 Well, combine the Thin Mint CRUNCH with the warm and gooey flavors that a freshly baked brownie offers and you have yourself one great recipe! Make this Thin Mint Brownie cookie recipe whenever Girl Scout Cookie season comes around. I LOVE semi-homemade recipes because they are easy to handle and the flavors are exactly what I look for from a dish. If I want more Thin Mint flavor, then I just add a few more cookies into my mixing bowl. The options are endless! Do I feel like adding a few walnuts into this week’s batch? Then I will just go ahead and do that. When you make semi-homemade, you spend a little time in the kitchen, but you get a big reward that still tastes like it was made from the heart. I feel like that last sentence pretty much defines me as a person. These brownies are no exception. A very simple recipe because I am using a box fudge brownie mix to start. Usually, you just need water or an egg to start setting that up. 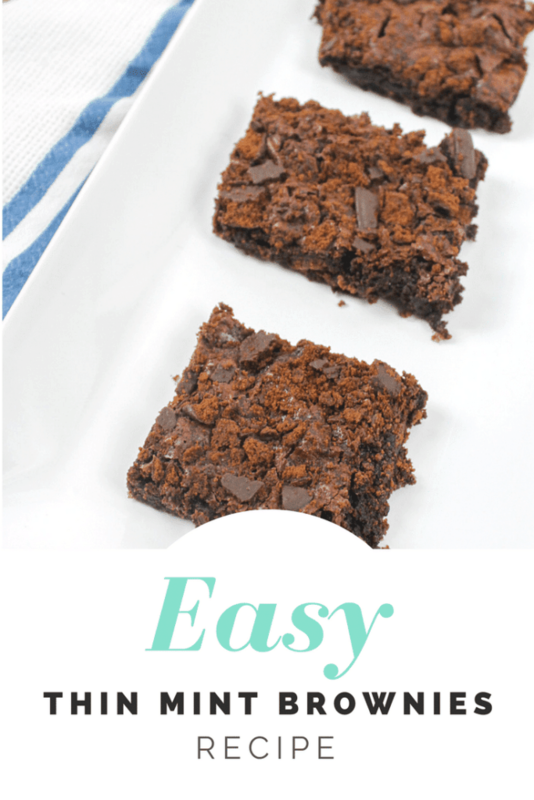 If you want to make homemade brownies, you can go ahead and do that. But I am not ashamed to say sometimes I don’t have it in me to make something from scratch. Prepare brownies according to directions but add 1 cup of crushed Thin Mint cookies to the mix. Pour the brownie batter into a pan. Top with 1/2 cup of crushed Thin Mint cookies. Bake for 20 minutes. Let cool and then serve and enjoy! What do you think about this yummy treat? 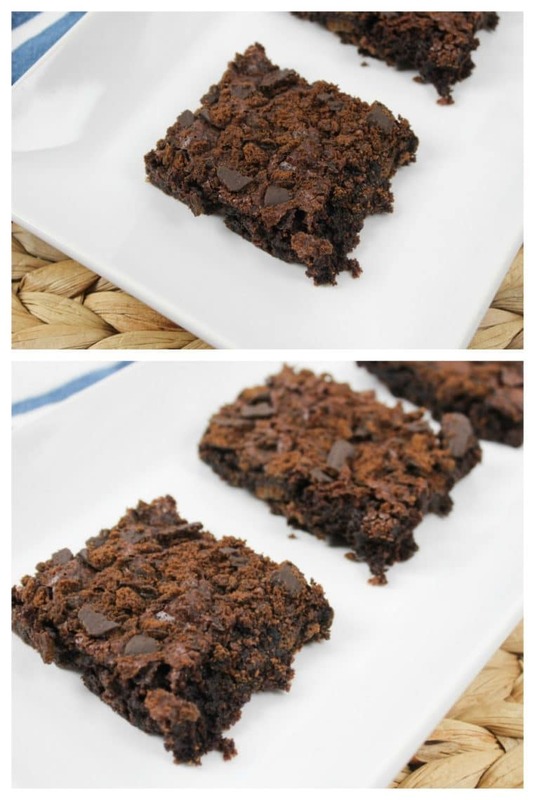 Think about it – you could add any type of cookie to your favorite brownie mix. Do you like Oreos? Go for it! The opportunities are limitless. Or if you want another delicious mint and chocolate flavor combo, give these Mint Ice Cream Cookie Cups a try! Oh man – if you make this Thin Mint Brownie Cookie recipe, you better invite me over. Prepare brownies according to directions but add 1 cup of crushed Thin Mint cookies to the mix. Top with 1/2 cup of crushed Thin Mint cookies. Previous Post: « Challenge Games: How Well Do You Know Your Family? This look like a new innovation idea. Pinned it for my upcoming coffee cafe!! I had never added mint with brownies. Let me try this today and sure will give you my quick response. This looks so so good, always been a fan of your blog and recipes. thank you for the brilliant share.